You can’t lay your eyes on a Raymond Weil watch and not think quality. These watches are crafted of the finest materials, and finished impeccably, and that outer beauty is not only a façade. 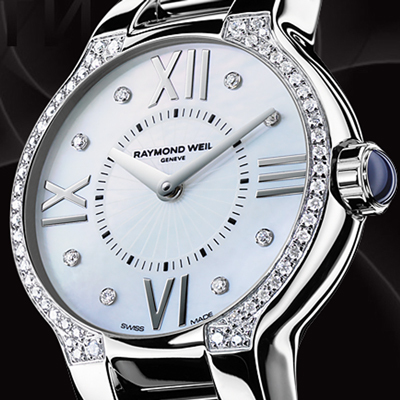 The Raymond Weil timepieces are true Swiss made watches, with decades of know-how in them. This elegant and luxurious line of watches, for men and women will surely feed your hunger for style. Their designs are diverse, from traditional to, almost futuristic, yet all have a common thread…excellence. One of their more conventional timepieces is the Noemia women’s’ watch. The Noemia is a Quartz model, crafted from solid stainless-steel. The dial, elegant in design, features a luxurious Mother-of-Pearl face, with a subtle, sunburst center, and brilliant diamonds accenting the hour markers. The face has raised, oversized Roman numerals at the quarter hour settings, and the bezel is encircled with, even more sparkling diamonds. The dial is covered by a sapphire crystal, and the crown is lacquered. The bracelet on the Noemia is a polished stainless-steel, with a folding clasp. Yes, the Noemia is one of the more traditional designs, but there’s no getting around the fact that it is stylish, and has some distinctive qualities. Raymond Weil, get to know the difference.